Self-driving cars are most definitely the future. They have been for decades. For Google, that future isn't quite as close as you might think—as of right now, its autonomous vehicle would fail a driver's license test before it ever got out of the parking lot. 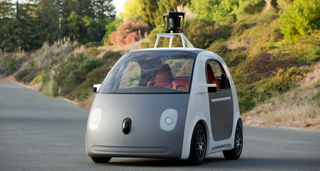 MIT Technology Review took a closer look at the driving challenges Google's driverless cars still can't tackle. Most of them are so ubiquitous, so mundane, it's almost funny. It's also a reminder: It'll be quite some time before humanity is permanently relegated to the shotgun seat. If we dunderheaded meatbags only ever had to drive in sunny, temperate weather, we probably wouldn't be so eager to hand the keys over to HAL. But most of us who rely on automobiles use them come rain, snow, or worse. The Version 1.0 driving software located between your ears knows how to react to changing conditions, whether that means avoiding ice, making out lane lines under the snow, or just taking it easy when the pavement's wet. Self-driving cars haven't quite mastered that yet. In fact, forget about snow—Google's autonomous runabouts haven't even been tested in heavy rains yet. Google's Chris Urmson tells MIT Technology Review that safety concerns have so far prevented it. Avoiding potholes isn't just about keeping your coffee from spilling out of your cupholder; those craters can do a number on your tires and wheels. But Urmson admits that Google's autonomous car won't recognize a pothole in the road—or worse, an open manhole—unless it's marked off with traffic cones. Yeesh. Autonomous cars don't have the nimble brain capacity to deal with unpredictable unknowns, so they rely on meticulously collected information from (human-driven) scanner cars that analyze the route ahead of time. Think Google Street View, but a thousand times more detailed. Every time Google's self-driving car trundles down a street, MIT writes, "intricate preparations have been made beforehand, with the car's exact route, including driveways, extensively mapped. Data from multiple passes by a special sensor vehicle must later be pored over, meter by meter, by both computers and humans. It's vastly more effort than what's needed for Google Maps." Unfortunately, a laughably tiny number of roads in the U.S. have been Googlified for autonomous car use. Yes, that number will naturally go up, and yes, it's unreasonable to expect a robocar with today's limited tech to explore uncharted territory. But this presents a hyper-magnified version of the same problem that faces electric cars: The inability to just get out there and go wherever. Okay, so you can't drive on wet roads, or rough roads, or unscanned roads. But even the roads you drive every day aren't necessarily a go—because they've definitely changed over time. That means road construction, with lane diversions, detours, alternate traffic routes, temporary stop signs, and all kinds of unexpected changes. Some of these changes can be picked up by the Google car's sensors. It's trained to recognize stop signs, for example, even if they're in unfamiliar places. But more complex changes, like a four-way stop, will send the little flivver into its slowest, most cautious mode of operation. "I could construct a construction zone that could befuddle the car," Urmson says. "Google says that its cars can identify almost all unmapped stop signs," MIT tells us, "and would remain safe if they miss a sign because the vehicles are always looking out for traffic, pedestrians and other obstacles." Don't worry about blowing that stop sign—the car will totally stop if it senses a problem. This is undoubtedly the most vexing problem with self-driving car tech: It's not great at detecting the humans that invariably pop up alongside (or in the middle of) the road. "Pedestrians are detected simply as moving, column-shaped blurs of pixels—meaning, Urmson agrees, that the car wouldn't be able to spot a police officer at the side of the road frantically waving for traffic to stop," MIT writes. That's bad news for pedestrians, cyclists, road crews, traffic cops—pretty much anyone who might be around when an autonomous car piddles by. And yes, it's going to change. It has to, if autonomous cars are going to someday share the roads with us in any meaningful way. The day will come when engineers teach these self-driving cars to navigate all these problems, and more. But even when that day comes, autonomous cars might not necessarily solve one of the biggest problems plaguing our roads: congestion. As we pointed out when Google first showed the world its koala-faced golf cart, autonomous cars of any variety still take up space on freeways and city streets. They still require parking spaces. Even if they're someday able to drive in space-saving formation, or weave through intersections in a choreographed dance that never requires a red light for cross traffic to pass, they'll still be eating up several square feet of road space per passenger. But Will They Make Us Safer? Volvo, the most brazen automaker when it comes to autonomous tech, has promised that by the year 2020 it will completely eliminate crash-related deaths in its cars. Clearly, snatching the wheel out of the average, easily-distracted homosapiens' hands will eliminate a whole lot of the 33,000 road fatalities in the U.S. each year. But as our own Wes Siler points out, eliminating human error entirely still leaves about 3,300 fatalities on the table. That's a huge improvement, but it's still more than sixty times the number of people killed in bus accidents every year. If you want the safest vehicle on the road, the best bet is still to skip the car entirely—no matter who's driving—and opt for public transportation. Especially considering self-driving cars can't even handle simple obstacles like snow yet. Until autonomous cars can safely navigate the complex world and its crosswalks, parking garages, rainy days, road debris, and tens of thousands of other unexpected distractions, we're still gonna have to steer and stop for ourselves. Google's Chris Urmson says he wants his company's self-driving cars to be road-ready by the time his 11-year-old son is eligible for his license. But until Google, and everyone else, can make an autonomous vehicle that's at least as capable as the moron in the car in front of you, that's probably a very optimistic target.